I Slipped In ASDA Can I Claim Compensation? If you have slipped in Asda, whether due to spills, misplaced objects, poor lighting or an uneven floor, you may be able to claim compensation for any injuries you have suffered. Every year in the UK thousands of people working or shopping in supermarkets and retail establishments across the country will be injured in some way. Whilst many of these injuries will be negligible, such as small cuts and bruises, some can be far more serious, resulting in broken bones and long-term rehabilitation. Other injuries can include damage to tendons and ligaments and head or back injuries. As a result of an accident in a supermarket, people can suffer physically, emotionally and even financially. A significant number of injuries are caused by slips, trips and falls, with the majority of these having been caused by a wet floor. If you have slipped on a wet floor in Asda, and this accident was caused by negligence on the part of the store, you could be entitled to claim compensation. What Are The Main Causes Of Asda Injury Claims? According to the Health and Safety Executive, the most common cause of injuries to shoppers and retail sector employees in the UK, whether in Britain’s supermarkets or the wider retail industry are slips, trips and falls. (You can see more information on the HSE site here). One of the most common causes of slipping over and claiming compensation from Asda or another supermarket is water or other liquids on the floor. Three main ways in which this can happen are smooth floors which are let wet after cleaning when there is a failure to keep a floor free from a liquid contaminant and spills which have not been cleaned up as effectively or speedily as they could be. All of these can indicate negligence on the part of the supermarket. In all of those circumstances, as well as incidences such as uneven flooring and general defects in the floor, or even poor lighting in part of the store, can result in someone having a slipped and fell in Asda compensation claim. What Is Asda’s Accident Policy And Liability For Injuries? Whether you have slipped in Asda or any other supermarket, the shop has a legal responsibility to and duty of care to have kept their customers safe from harm. The supermarket must always take all the steps they can reasonably take to prevent any accidents on their premises, whether in the shop or wider grounds. Their duty of care is set out in the 1957 Occupiers Liability Act. This act states that all retail owners (and occupiers) must keep their premises reasonably safe for visitors. There is also separate legislation covering responsibility for workers safety. The primary piece of legislation here is the Health and Safety at Work Act of 1974. This sets out that all employers must identify and manage risks to their staff, as well as providing the necessary training in their job and general health and safety. To comply with these articles of legislation, supermarkets (such as Asda) need to carry out regular risk assessments to identify and alleviate any risks. 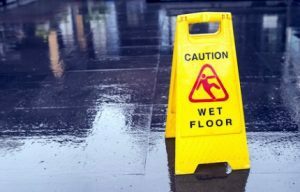 Wet floors and spillages, whether caused by cleaning procedures, leaking equipment, weather and spills of foods and beverages are the most common causes of slips, trips and falls. The supermarket needs to ensure there are appropriate procedures to deal with all of these as quickly as is reasonably possible. In Asda slip claim cases, it can sometimes be difficult to prove that the supermarket had a reasonable amount of time within which to rectify the spill or obstacle. If you have slipped on water in Asda or any other shop, you should report the accident, following the Asda accident policy. This means getting your accident recorded in their injury book and following any other procedures the shop has. This can help our solicitors to build your case. How Much Compensation Can You Claim If You Slipped And Fell In Asda? To determine the rate of supermarket slips compensation, how much are you owed, your injury is the most important thing to look at. Compensation and damages awards are set within brackets according to injury type by the Judicial College. The figures set out by these guidelines will be assessed in respect to the type and extent of the injury. It will also take into account how long and the likelihood of your recovery. The guidelines set out a minimum and maximum amount of compensation band. Whilst these guidelines are not legally binding, they are widely accepted and adopted by courts and solicitors in the majority of cases. Our table here sets out some injury compensation award examples. Neck Injuries Severe £50,000 - £99,500 Neck injuries can include serious fractures of and damage to spinal discs leading to permanent disabilities. Neck Injuries Moderate £19,000 - £29,250 More moderate symptoms include dislocated tendons moderate fractures. Back Injuries Severe £29,475 - £53,000 Fractures to the spinal discs or other vertabral bodies, including some soft tissue damage. Back Injuries Moderate £21,100 - £29,475 Includes a wide range of injuries which will cauae lasting pain and discomfort. Leg Injuries Moderate £21,100 - £29,800 Knee damages which can result in muscle wasting and limited joint movement in the future. Leg Injuries Moderate £6,925 - £10,700 Simpler fractures where their is no lasting damage. Knee Injuries Serious £53,000 - £73,125 Disruption to the joint the potential to develop osteoarthritis. Knee Injuries Serious £39,625 - £53,000 Fractures extending into the knee joint, causing lasting pain and discomfort. As well as general damages for your injury, you may also be able to claim special damages or any costs you have incurred as well as any loss of earnings. At Legal Expert, we provide a comprehensive no win no fee service to help you get the Asda compensation payouts you may deserve. No win no fee agreements, also known as a ‘Conditional Fee Agreement’ are a special type of contract which is drawn up between a solicitor and a claimant. The no win no fee agreement will be the basis of the relationship between the solicitor and the claimant. It will set out the work that the solicitor will do for the claimant, and how they will be paid. It will lay out that if the solicitor does not get the claimant an award or Asda compensation payouts, no fee will be chargeable. If the specialist legal solicitors who with Legal Expert are successful in your case, our fee will be taken as part of the compensation award. By law you must keep at least 75% of your award, however, your agreement will detail this further. At Legal Expert when you are making your slipped on water in Asda claim there will never be any hidden costs. To start your slipped in Asda or any other personal injury compensation claim, talk to the experts’ legal solicitors at Legal Expert today. We are on hand seven days a week to answer your calls and can connect you with one of our panel of specialist solicitors. Call us on 0800 073 8804, email us, or use our contact forms. Use our guide to slips on wet floors to find out how much compensation you could be entitled to. If you slipped and fell in Asda, use our handy guide to find out more about how to go about getting the compensation you deserve.